The average general health article on pancreatic cancer states flatly that this type of cancer shows no early symptoms. Most people diagnosed with pancreatic cancer are already in the advanced stage of the disease by the time it's caught, and the typical prognosis is death within five years. Only 4 percent of pancreatic cancer patients live beyond five years. In recent years, pancreatic cancer has claimed the lives of numerous celebrities and public figures, including Steve Jobs, actor Patrick Swayze, and actress Bonnie Franklin, leading many people to ask the key question, "Are there any early warning signs of pancreatic cancer?" The answer is yes, there are. But to understand these signs and symptoms of pancreatic cancer, it's important to understand where the pancreas is, and what it does. Located deep inside the abdomen, the pancreas is only 4 to 6 inches long and shaped like a tadpole. In the "tail" of the pancreas are cells that produce insulin, and tumors at this end are usually endocrine tumors. They're easier to diagnose, but are much rarer. At the other end, the "head" of the pancreas, are cells that produce digestive enzymes, and tumors at this end are called exocrine tumors. These are by far the most common, and are much more difficult to detect. However, the idea that a pancreatic tumor is asymptomatic is a bit of a myth. Dig deep into journal articles and ask patients what they remember and the result is a long list of odd signs and symptoms of pancreatic cancer to watch out for. Taken one by one, these symptoms could mean many things. But if you find yourself experiencing two or three of these early warning signs of pancreatic cancer, call your doctor and ask for a scan. Imaging techniques such as MRIs can detect pancreatic cancer some of the time, depending on the location of the tumor. • Diabetes, especially if it comes on suddenly. Recently, the Mayo Clinic published startling research showing that 40 percent of pancreatic cancer patients had been diagnosed with diabetes one to two years before discovering they had a pancreatic tumor. Researchers believe the diabetes is caused by tumors that simply haven't been detected yet. The problem is, diabetes is very common, and the majority of diabetes isn't pancreatic cancer, so doctors are trying to develop screening tools to tell the difference. Right now, they say family history is an important clue. If you're diagnosed with diabetes that seems to come on suddenly and you have no family history of diabetes, bring this to your doctor's attention and ask for further screening for pancreatic cancer. • ﻿ Yellowing of the eyes or skin﻿. 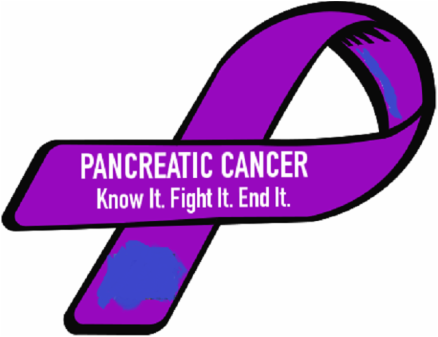 Even a small pancreatic tumor can block the bile duct in the head of the pancreas, causing bile to build up. This causes jaundice. • Itchy skin, palms, and soles of feet. A little-known side-effect of jaundice is itchy hands and feet. It's due to a skin reaction to the bilirubin, the yellowish brown liver chemical that causes jaundice. • Lack of appetite. An Italian study found that six to eight months before being diagnosed with pancreatic tumors, patients reported a sudden drop in their appetite and a tendency to feel full after eating very little. • Changes in taste. In the same Italian study, some of the patients surveyed said they'd suddenly lost their taste for coffee, wine, and smoking. In fact, they said, they felt "disgust" for the smell and taste of coffee and alcohol. • Abdominal pain. Pancreatic cancer sufferers remember this pain as a gnawing pain, rather than a sharp cramp or ache, and it radiates toward the back. A characteristic clue: the pain goes away when you lean forward. • An enlarged gall bladder. The same blockage of the bile duct that causes jaundice can also cause an enlarged gallbladder, as the bile builds up behind the duct. The good news is that an enlarged gallbladder can be seen on imaging tests, and it may even be possible for a doctor to feel it during a physical exam. • Pale, floating, smelly stools. If a pancreatic tumor prevents digestive enzymes from reaching the intestine, the result is an inability to digest fatty foods. So you end up with loose, smelly "floaters" as a result of the excess fat. Doctors say this symptom, in particular, can be an early clue and is too often overlooked. • Dark, tarry stools. Bleeding in the upper intestines causes this symptom. • Sudden, unexplained weight loss. Weight loss is not always, as many people mistakenly believe, a sign of advanced cancer that's spread to the liver. It can also happen because a lack of pancreatic enzymes is causing fat to pass through the body undigested. What do you do if you're worried about any of these symptoms? Document all symptoms, and report them to your doctor in as much detail as possible. If your doctor is convinced you have legitimate concerns (and remember, you may have to do some convincing), tests such as an ultrasound, a CT scan, and an endoscopy followed by a biopsy can be used to search for a pancreatic tumor. A blood test is now available for a biomarker called CA 19-9 that is released by pancreatic cancer cells. Unfortunately, by the time CA 19-9 reaches detectable levels, the cancer is usually no longer in the early stage, although the test is useful during treatment and for detecting recurrence. Another biomarker test, CEA (carcinoembryonic antigen), is also not sensitive enough to provide early diagnosis. While tragic early deaths like Steve Jobs' are the hard reality of pancreatic cancer, there are also people living productive lives thanks to an early diagnosis of pancreatic cancer. Such was the case with Supreme Court Justice Ruth Bader Ginsburg, who's still practicing after having a tiny pancreatic tumor surgically removed. Yes, she got "lucky," as she put it -- but she also got a CT scan, which is how the tumor was found. Whether you (or a loved one) are worried about developing pancreatic cancer, have just been diagnosed, are going through treatment, or are trying to stay well after treatment, this detailed guide can help you find the answers you need. Click on the topics below to get started.